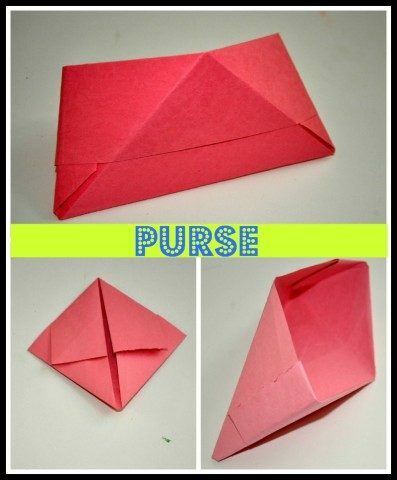 Origami means ” folding paper”. 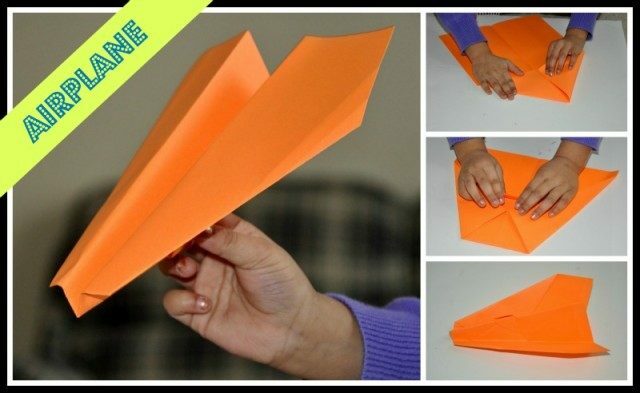 Origami for kids can be much more than a craft activity. Being a preschooler, I wondered if she will be able to understand the concept of folding and making objects. Well, I decided to give it a try and I chose the simplest things to make. This is not a tutorial on how to do them but a post to encourage you to explore this technique with the kids. Origami aids in bi-lateral development of the brain. 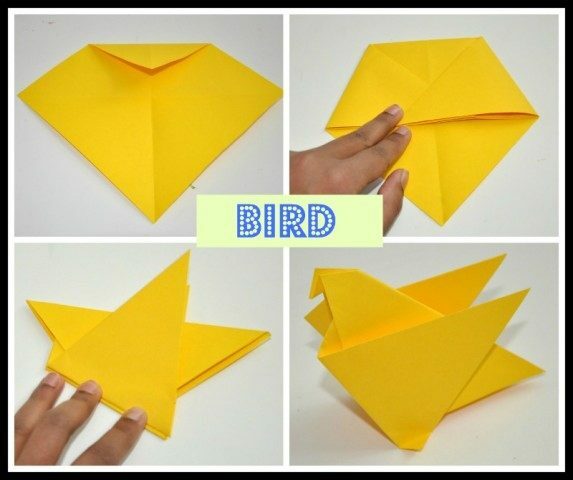 This simple means that Origami helps stimulate both the left and the right hemispheres of a child. At a young age, kids tend to use both their hands and they grow up one hand becomes dominant and other passive. The left hemisphere is responsible for right hand control, analytical and sequential thinking. The right hemisphere is responsible for left-hand control, holistic and creative thinking and appreciation for art and music. It s obvious that a typical child will be taught the left-brain way because of the dominant right handed population. However, if both the hemispheres are adequately stimulated, the inter-hemispheric iertaction will aid the child in his/her life. Like many activities in Origami there isn’t a dominant hand and a passive/supportive hand. Both the hands have to work in a symmetrical pattern to achieve intended results. By engaging both the hands and hence both the hemisphere enough input is sent to the brain to stimulate both the parts of the brain. 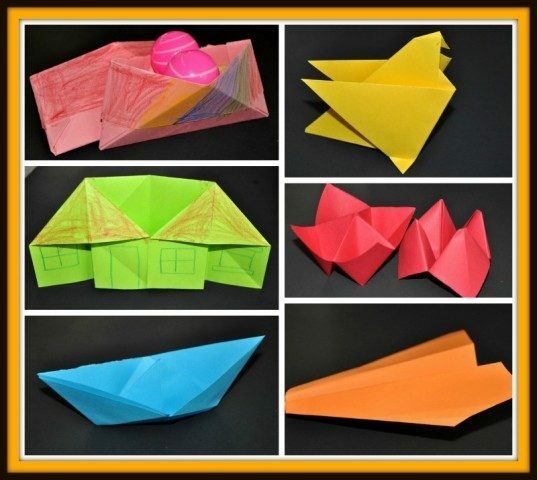 Origami is a wonderful tool to teach spatial skills, understanding of space and the relationships between shapes. Encouraging my child to try to convert 2-d to 3-d is a personal goal of mine. Having said this at 4, Origami is still a very adult involved activity. This was more me showing her possibilities and opening her to a new world of this ancient “folding paper” technique. There has been enough said about spending time with your kids. Today’s parents are overwhelmed by all the things they need to do. The quality of time, in my book, is more important than the quantity of time that we worry so much about. Setting up open ended art projects and play stations is one thing and it does provide quality time, but I also feel being actively involved in playing something with them takes the idea of “Quality time” to a whole new level. 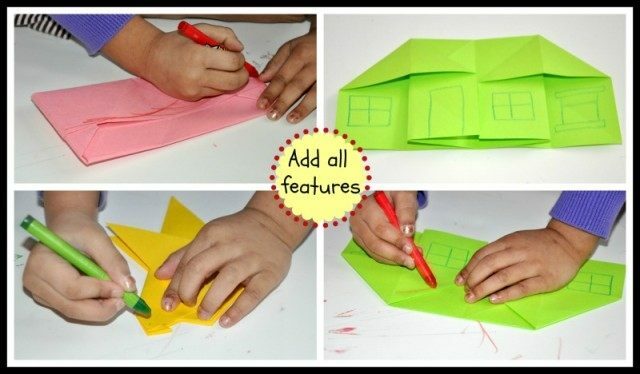 An involved activity like Origami requires a good communication, building , crafts , motor skills and all the fun to see your work come alive. Colored printing paper. Construction paper is too thick and not very pliable. If you have never done origami paper crafts, I would recommend you visit your local library and borrow a few books on the subject and try a few crafts. Choose simple ones that your child can play with, knows about and understands. 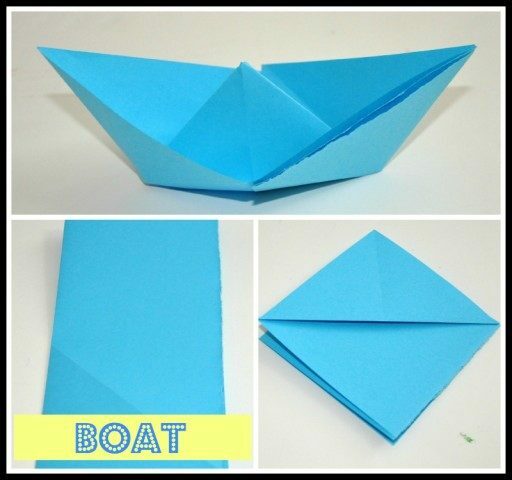 Who doesn’t like to build boats? Play with them in the tub or if weather permits take them to a stream or lake. Use this to teach geometry an symmetry. 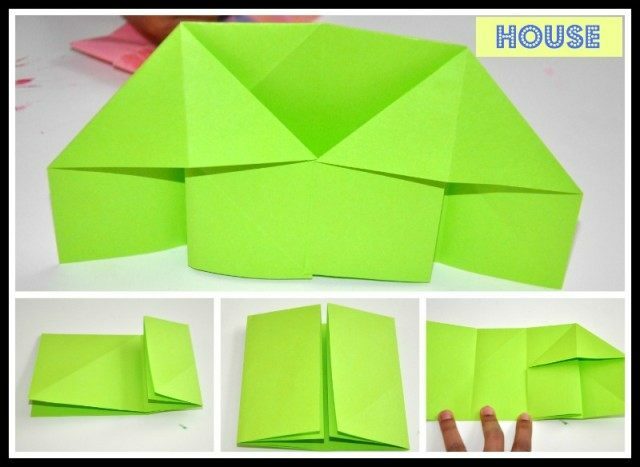 A square sheet of paper when folded diagonally turns the square into 2 triangles You can contrast it by folding the square sheet in the middle and show that it makes 2 rectangles. A House. Make a few more and build a neighborhood. A Bird: Make extras and create a bird house. The best part is to add all the features. Shopping anyone? Use it as a purse or as a container for your play. Here is our display. My4 yr old was thrilled to see what a few folds to a piece of paper can do. And that was my goal ! Now its your turn to make a few of these and more. Come back, show off and tell us your experience.